Last weekend the girls and I decided we were in desperate need of some food. But not just any food. We were in the mood for that Southern Baptist staple. That's right......Fried Chicken. It was only 9 o'clock at night, so we decided to head to the one place that we were sure to find the object of our desire. KFC. 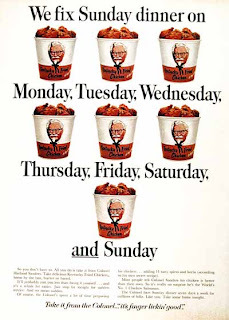 That would be- Kentucky Fried Chicken for those of you that have lived a sheltered life up until now. Upon reaching the worlds most famous source of that secret recipe, golden battered and deep fried poultry goodness, we headed straight to the drive through window. Once there, I would like to say we were warmly greeted by a representative of KFC...but it would be more accurate to say we were confronted by a pink haired young woman who's name badge identified her as Shenikwa. One of KFC's finest, I'm sure. It was there that she delivered the saddest news this Southern girl will ever hear... and I quote..
" Uh Huh Girl, We Ain't Got No Chicken ". More than a billion of the Colonels "finger lickin' good" dinners are served annually in more than 80 countries and territories around the world..... Just apparently not where I live. My friend Z and I look at each other in disbelief, simultaneously thinking "Is she serious"? I mean c'mon now...the sign says Kentucky Fried CHICKEN. Its in their name...they put it on their sign...ITS WHAT THEY DO... Isn't it? Apparently Shenikwa could see the puzzled and confused looks on our faces....... So she turned to her fellow employee at the counter for confirmation of her previous statement. "Yolanda..we got any more chicken"? "No girl...and we ain't making no more..we only gots an hour till we close". What does she mean only an hour? The Colonel believed that properly fried chicken should take at least 45 minutes. That was up until the discovery of the pressure cooker which reduced times considerably....... Just apparently not where I live. I admit we were temporarily stunned by this news...but decided not to let this minor setback prevent us from fulfilling our quest of finding some delicious golden fried crispy goodness. However..after a futile search all over town that consisted of two more grocery stores and one Walmart deli...we had come to the sad conclusion that there was absolutely no fried chicken to be had in the entire city limits. This revelation was disturbing on a number of levels. First of all as I pointed out already.... I live in the South and in what is considered the bible belt. Not trying to sound stereotypical here...But we are a fried chicken society. It is a staple...a mainstay of southerners and baptists alike. So how could a small southern town be completely out of chicken on the most important chicken eating night of the week....Sunday. Was this just poor planning on someones part? Possibly to much demand and not enough supply? This may seem like a trivial thing to most of you...But in my family...and maybe in the south in general..Fried Chicken can be directly related to salvation itself. Half of the individuals in my family alone would have never found the lord if it wasn't for those Sunday fried chicken dinners at the church. While I don't think there are any direct quotes in the bible concerning the value of fried chicken and salvation going hand in hand...I can say that I personally have had what could be considered a religious experience eating when it. That is until last Sunday..Black Sunday...The day of K F but NO C.